The only person in 1948 who thought Truman had a chance in 1948 was Harry, and even he wasn't all that convinced. Everett Collection President Harry S. Truman holds up the newspaper which has the headline that mistakenly reports ‘Dewey Defeats Truman’. The only person in 1948 who thought Truman had a chance in 1948 was Harry, and even he wasn’t all that convinced. The President’s efforts had not been altogether wasted…But when he damned the Eightieth Congress and the Taft-Hartley law, nobody seemed really to care or listen…Harry Truman’s sarcastic reply that the Republicans just kept saying, “I can do it better,” had boomeranged. The people thought the Republicans probably could do it better.—Time, November 1. What will Dewey do? Find out in the November issue of Kiplinger Magazine, just off the press. Here the Kiplinger organization, nationally famous for its twenty-five years of reporting the news of Washington, gives you its accurate, down-to-earth analysis and forecast of what to expect from the new Administration. It will help you dispel the campaign fog.—Advertisement in Time, November 8. What Dewey Will Do, Thirty-two Page Feature Complete in This Issue. [The introductory article explains] Why you need to know what Dewey will do. You’ve got to live with him for four years, possibly eight. He will influence your life, your living, your thinking, your work, your business.—Kiplinger Magazine, November. Between election and inauguration day—with a Dewey victory—an Administration that stands defeated and on the way out of office will continue to run the country…Mr. Truman in the seventy-eight days between election and inauguration day will function as President, making decisions, shaping policies, filling jobs that all may be undone after January 20.—U. S. News-World Report, November 5. This year the Presidential race can be taken for granted…as we view this campaign from a detached position, we all know that the trend is conservative…My guess is that there will be a dozen or so more Republicans in the new Congress.—Raymond Moley in Newsweek, November 1. Dewey is in, of course…Operation Takeover—the Dewey Team’s preparation for picking up the reins of the national government—will headquarter in Albany. Dewey himself plans to remain as Governor of New York until shortly before inauguration day.—Business Week, October 30. The one outcome of the November election about which any serious doubt is expressed by objective-minded persons is the political complexion of the new Senate.—Mark Sullivan in the New York Herald Tribune, October 1. The U. S. was about to ditch Truman and take Dewey for reasons that involved the brain as well as the emotions. And the next President would find his ideas in tune with those of a great majority of his people.— Life news story, November 1. Today it is unthinkable that in any national election a modern polling organization could make an error as great as that registered by the Literary Digest in 1936 (19 percent); for that matter, it is highly improbable that an error half as great as that of the Literary Digest could be made by modern polling procedures. This is true because modern polls pay great attention to the selection of the cross-section. Returns are carefully checked to discover the extent to which they are unrepresentative. Moreover, polling organizations are aware of the great importance of the time factor and for this reason usually insist upon polling almost up to the day of election.—George Gallup in “A Guide to Public Opinion Polls” (1948). The first post-election question is how the government can get through the next ten weeks…Events will not wait patiently until Thomas E. Dewey officially replaces Harry S. Truman.—Joseph and Stewart Alsop, in many newspapers, November 3. How long will the Ice Age last? As realists, we must recognize that Dewey will probably be elected.—Max Lerner in the New York Star, October 17. Dewey is sure to be elected. I predict he will be a first-rate President.—Drew Pearson, in many newspapers, October 14. This writer gave Dewey 61 more electoral votes than the [Newsweek] poll average of 376, Thurmond 3 more, and Truman 64 less. We guessed the Republicans will get 54 Senators in the next Congress as against the poll average of 50. The poll average sets the new House at 256 Republicans, 177 Democrats, 2 independents. Our guess was 265 Republicans, 160 Democrats, 3 independents.—John O’Donnell, the New York Daily News, October 7. Dewey is going to be the next President and you might as well get used to him.—T. R. B. in the New Republic, October 25. The G. O. P. victory in 1946 reduced the riddle of 1948 pretty largely to “How much?” rather than “By whom?” …Harry Truman deserves well of the nation. He was not a great President, though he may some day, not far off, become a great Senator.—T. R. B. in the New Republic, November 8. I rashly predict as follows: Out of an estimated total vote of 55,000,000 Dewey should poll 27,500,000; Truman, 23,500,000; Wallace, 2,250,000; Thurmond, 1,250,000; Thomas, 400,000; scattered, 100,000— Robert Bendiner in The Nation, October 30. 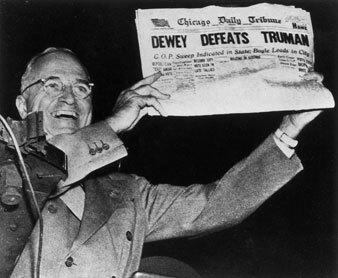 DEWEY DEFEATS TRUMAN.—Chicago Daily Tribune, November 3.